On June 6-7, London will host Blockchain International Show, one of the European largest exhibitions and conferences dedicated to blockchain technology, cryptocurrencies, and ICOs. The exhibition area will involve leading crypto companies that will present their latest solutions. Cryptocurrencies and blockchain are still the focus of European regulators’ attention. Valdis Dombrovskis, Vice-President of the European Commission, admits that the cryptocurrency market has become global and blockchain technology has a huge potential. “Crypto asset markets are global, with worldwide transactions between investors, consumers, and intermediaries. And blockchain technology holds strong promise for financial markets. To remain competitive, Europe must embrace this innovation,” Valdis Dombrovskis says. The popularity of digital assets are proved by the reports. Coindesk, one of the largest news portals dedicated to the cryptocurrency industry, conducted the global research of funds raised using venture financing and ICOs in the past six years. 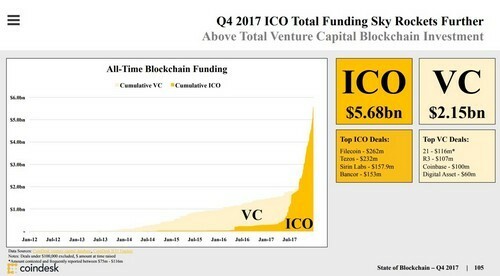 It appeared that ICO projects all together collected more than $5.5 billion (the majority of them were launched in 2017), while venture investment projects attracted a bit more than $2 billion. Despite the popularity of digital assets, Europe still has no approach to their regulation. Mario Draghi, President of the European Central Bank, said in February that the regulation of cryptocurrencies was beyond the ECB activity. Therefore, the German authorities have signed the act in March, equating digital assets to payment methods in the tax context. Now, purchases for cryptocurrencies won’t be imposed to capital outflow tax; only VAT will affect them. Lex Sokolin — Global Director Fintech Strategy, Partner at Autonomous Research, UK. They will also discuss development trends in blockchain technologies and share their experience of launching high-tech businesses. The exhibition is free-to-enter. It will engage 140 companies: mining equipment providers, blockchain developers, ICO projects, investment funds, cryptocurrency wallets, trading platforms, and law firms. All participants are ready to cooperate: they are potential business partners or investors. They will show the latest novelties: developers will be interested in software solutions, miners in powerful hardware for farms, and entrepreneurs in financial, technological, and consulting services for all types of businesses. Exhibition guests will examine crypto industry trends as well as discover how and where one should store cryptocurrencies, which of them is the most appropriate for mining, how to earn on cryptocurrency trading, and what crypto project is worth investing. Follow the news of Europe’s largest blockchain event on the official website of Blockchain International Show.